Traumatic accumulation of blood in the anterior chamber is one of the most challenging clinical problems frequently encountered by ophthalmologists., It could result from either a preventable eye injury like a deliberate punch to the eye or a projectile object. Traumatic hyphema could either be from closed- or open-globe injury. Spontaneous hyphema which could be confused with traumatic hyphema may be secondary to neovascularization (secondary to diabetes mellitus, ischemia, and cicatrix formation) and ocular neoplasms (e.g., retinoblastoma, iris melanomas, and medulloepitheliomas). Traumatic hyphema is an important clinical entity because of the risks associated with a significant initial reduction in vision and also because of associated injuries to the tissues of the eye. It uncommonly causes permanent loss of vision in the absence of associated damage to the cornea, lens, or optic nerve. The loss of vision depends on the level of hyphema; a patient with a microhyphema occasionally may present with normal vision or with somewhat blurred vision, whereas a patient with a full hyphema may present with almost complete loss of vision. A small hyphema due to ocular injury can be a sign of major intraocular trauma with associated damage to vascular and other intraocular tissues. Complications resulting from secondary hemorrhage, such as glaucoma, corneal blood staining, or optic atrophy, can lead to permanent impairment of vision, especially if the hyphema is prolonged in association with elevated intraocular pressure (IOP). This study was to determine the prevalence of various ocular injuries in patients that were managed for traumatic hyphema in this center. Grade 4 – total clotted blood also called blackball or eight-ball hyphema. Data were expressed as mean ± standard deviation and frequency expressed as a percentage. The relationship between categorical data was analyzed using the Chi-square (χ2) test. A value of P < 0.05 was considered statistically significant. The study was conducted in accordance with tenets of the Declaration of Helsinki. Ethical approval was obtained from the Institutional Ethical Review Committee. There were 45 eyes of patients who presented with traumatic hyphema in the eye clinic during the period. This constituted 4.2% of all the ocular emergencies (1054) treated in our center. There were 37 (82.2%) males and 8 (17.8%) females with a male-to-female ratio of 4.6:1.0. The age ranged from 6 months to 84 years with a mean age of 25.1 ± 19.9 years with 23 (51.1%) occurring in the left eye, whereas 22 (48.9%) in the right eye. [Figure 1] shows that males consistently outnumbered the females across all age groups. 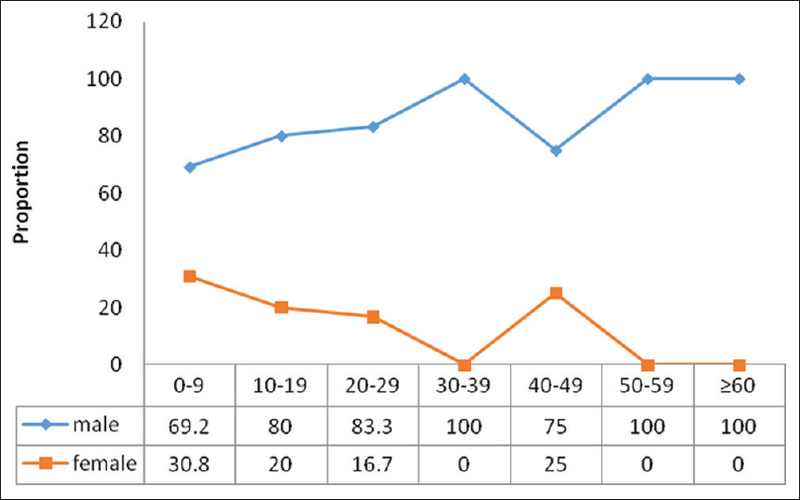 Majority of cases 36 (80.0%) occurred among the age groups <40 years. Of 45 cases, 32 (71.1%) presented with blindness (<3/60) in the affected eye with the worst presentation of which 90.9% occurring in the Grade 4 hyphema [Table 1]. 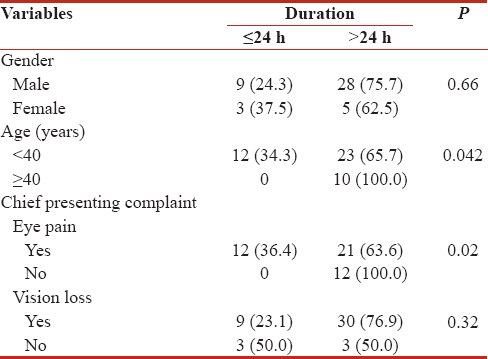 Thirty-three patients (73.3%) presented more than 24 h to the eye facility from the time of injury. Gender and vision loss did not significantly affect the time of presentation. However, age and eye pain significantly affected the duration of presentation of patients to the eye facility [Table 2]. 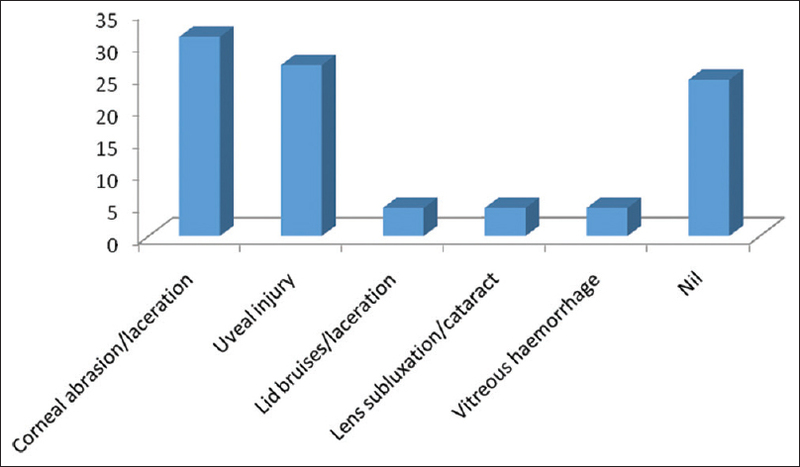 [Figure 2] shows that other ocular injuries in these patients were present in 34 (75.6%). Many of these patients 14 (31.1%) presented with corneal pathology ranging from corneal abrasions to corneal laceration followed by uveal injury 12 (26.7%) though substantial proportion of patients 11 (24.4%) presented with no other associated ocular injury. [Figure 3] shows that 39 patients (86.7%) presented with raised IOP compared with 6 (13.3%) patients who presented with normal IOP (χ2 = 24.200, df = 1, P = 0.001). This has been ascribed largely to males involving in vulnerable activities or occupations that predispose them to sustaining ocular injuries. These injuries could be minimized by engaging in preventive campaign that will ensure the use of protective eye device by these vulnerable group and the use of appropriate machine guards positioned over obvious hazards. Majority of cases occurred among the young, economic, and reproductive age group. The economic burden of blindness in the young adult has great impact on the socioeconomic status of any community. This should be handled with utmost importance since it was reported that understanding the costs of a condition is useful for making an economic argument about efforts to reduce the burden of the condition. Majority of our patients presented with uniocular blindness with largest proportion occurring in patients with Grade 4 hyphema similar to other reports.,, This may not be different from some factors reported in the literature which include time of presentation, grade of hyphema, and associated ocular injury. Majority of the patients 33 (73.3%) presented more than 24 h to the eye facility from the time of injury. This was significantly affected by age and eye pain as the chief complaint. This is similar to some studies conducted in other parts of the country,, but contrary to another study where higher proportion presented within 24 h of injury., Despite the fact that early presentation is known to influence good prognosis and eye pain, a chief complaint which is usually scary and uncomfortable making patients to seek medical attention early, substantial proportion still presented late to the eye facility. This observation might be due to the ignorance or financial incapacitations although not assessed in this study. The prevalence of ocular complications associated with traumatic hyphema was 75.6%, with corneal pathology as the leading complication ranging from corneal abrasions to corneal laceration followed by uveal injury. This is contrary to the findings in Benin city study where lid injuries topped the list of associated eye complications with traumatic hyphema. Apart from the consequential visual sequelae arising from the traumatic hyphema, the corneal complications coupled with the delay presentation will further worsen the visual prognosis of these patients. To minimize this bad prognosis, the management should involve counseling of patients on early presentation, meticulous examination of the injured eye with all the available modern equipment, and quick and appropriate surgical intervention as indicated to prevent corneal staining. More than five-sixths of patients (86.7%) presented with raised IOP contrary to a report where only 13% had elevated IOP. All these patients were managed medically with 26.7% of them having surgical interventions. The prevalence of associated ocular complications with traumatic hyphema was high with corneal injuries as the most ranked complications. To reduce the consequential poor visual prognosis, management should involve counseling on early presentation, meticulous examination of the injured eye, and quick and appropriate surgical intervention as indicated to prevent corneal staining. Weakley D, Cotsonis G, Wilson ME, Plager DA, Buckley EG, Lambert SR. Journal browser. Am J Ophthalmol 2017;26:32Z. Al-Saffar AA, Hussein AS, Jamal NM. Traumatic hyphema frequency and management evaluation: A retrospective study. Health Sci J 2016;11:1-10. Kiratli H, Tarlan B, Kasım B, Söylemezoǧlu F. Malignant teratoid medulloepithelioma of the ciliary body presenting with spontaneous hyphema. J Fr Ophtalmol 2014;37:e137-9. Gharaibeh A, Savage HI, Scherer RW, Goldberg MF, Lindsley K. Medical interventions for traumatic hyphema. Cochrane Database Syst Rev 2011;1:CD005431. Alotaibi AG, Osman EA, Allam KH, Abdel-Rahim AM, Abu-Amero KK. One month outcome of ocular related emergencies in a tertiary hospital in central Saudi Arabia. Saudi Med J 2011;32:1256-60. Enock ME, Omoti AE, Alikah AA. Risk factors identification for ocular trauma in patients who presented in a suburban tertiary care hospital in Nigeria. Saudi Med J 2007;28:1385-8. Onyekwe L. Spectrum of eye injuries in children in guinness eye hospital, Onitsha. Niger J Surg Res 2001;3:126-32. Lipscomb HJ. Effectiveness of interventions to prevent work-related eye injuries. Am J Prev Med 2000;18:27-32. Frick KD, Kymes SM. The calculation and use of economic burden data. Br J Ophthalmol 2006;90:255-7. Uhumwangho OM, Umolo OC. Traumatic hyphema in Benin city, Nigeria. Sahel Med J 2014;17:128.